I've been heat-styling my hair quite a lot recently so I felt it was a good time to try out a slightly more intensive hair mask than the type I'd usually go for. Now, despite not getting on particularly well with the Moroccanoil conditioner (which I felt left a silicone-like residue on my hair), I really admire the brand which can be credited with bringing wonder-ingredient Argan Oil into the mainstream consciousness. What's more, I really like the bright & bold packaging which is modern whilst remaining true to the nature of the product. 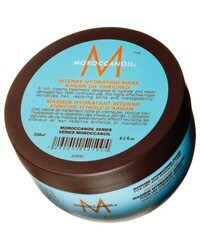 Moroccanoil Intense Hydrating Mask promises to rehydrate, improve elasticity and restore managability. So... does it deliver? The creamy texture of the mask meant that it was easy to work through my hair. I liked the sweet scent, although it didn't linger in my hair once rinsed out. In terms of practical usage, my favourite aspect of Intense Hydrating Mask is that you only need to leave it in hair for 5 minutes so there's not a big time commitment in order to see results. I really struggled with the rinsability of the mask- it took quite some time to wash the product out of my hair and even then, I wasn't sure that I had removed every last trace. For this reason, I felt really unsure about this mask and felt that it would put me off using it again. Having said this, once dry, I didn't feel that my hair was weighed down. It was easy to control when styling and felt unbelivably soft. The results were impressive. Once my hair was blow-dried, it was shiny and bouncing and even though I hadn't taken any more care than usual over styling, it almost looked Chelsea-salon worthy. I definitely feel that it delivers on the claims. However, at over £20 for 250ml, I'm not sure I'd part with my own money if I hadn't received this as a PR sample. I really liked how it left my hair but given the issues I had with rinsability, I'd rather invest in something more enjoyable to use such as a mask from Phyto or Alterna.